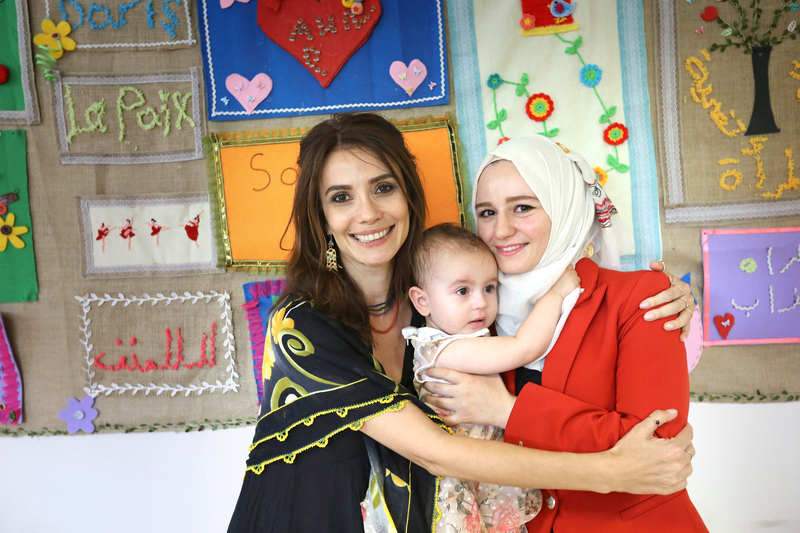 Songül Öden, acclaimed actress and a spokesperson for the UNFPA Humanitarian Aid Programme, visited the UNFPA Women and Girls Safe Space (WGSS) in Istanbul. The WGSS is funded by European Civil Protection and Humanitarian Aid Operations (ECHO) and operated by the implementing partner, Association for Solidarity with Asylum Seekers and Migrants (ASAM). During her visit, Öden interviewed Amani Madi, a Syrian refugee woman working as a health mediator and acting as a liaison between Syrians and the WGSS. They talked about how war in Syria transformed Amani Madi’s life, her experiences as a refugee in Turkey, and how she began working with the UNFPA Humanitarian Programme. Amani Madi came to Turkey in 2015, and was married by the age of 20. Now 23 years old, Amani Madi is a mother. Since 2016, she has been working to inform Syrian refugees of the WGSS services, an has been following up centre’s beneficiaries. Amani Madi stated that meeting with Songül Öden made her feel “very happy and valuable”. The following transcript of Songül Öden and Amani Madi’s meeting highlights the challenges Amani Madi faced in a war-torn Syria, her hopes for the future, and the struggle she endured to have a happy life. Songül Öden: Were you working when you were in Syria? Amani Madi: I was a university student, studying to become a teacher. Songül Öden: Were you able to complete your education? Amani Madi: I was forced to leave in my third year because of the war. Songül Öden: Did your family come with you or stay behind? Did you leave your everything behind? Amani Madi: I left most of my family and my possessions behind. Songül Öden: Why did you decide to come to Turkey? Amani Madi: We decided to leave Syria with my father and my little brother. There was no education, no security, no electricity, no water...we couldn’t take it anymore. I wanted to complete my education but unfortunately had to drop out and leave the country. Songül Öden: How did you feel when you first arrived in Turkey? Amani Madi: I felt terrible. I’d left my family behind in the middle of a conflict. And the trauma of war took its toll on me. Songül Öden: Which city did you first arrive in? Where did you go to find refuge? Amani Madi: I went to Şanlıurfa. My sister had been living there, she’d left Syria before I did. Songül Öden: How did you first visit a UNFPA Women and Girls Safe Space? Amani Madi: In Istanbul. I visited the WGSS run by the Association for Solidarity with Asylum Seekers and Migrants, and immediately felt better in many ways. Songül Öden: What did you experience in your first visit? Amani Madi: I spoke with social services personnel. She patiently listened to my entire story and was very kind to me. Songül Öden: Did you feel safer after your visit? Amani Madi: Yes. They gave me courage. I felt stronger. Songül Öden: How did you start working at this UNFPA Women and Girls Safe Space as a health mediator? Amani Madi: I really liked the idea of working as a health mediator. I cannot forget the positive transformation that I personally experienced, and the empowerment that I felt after visiting the center. I wanted other women to experience the same feelings I had, therefore I was very motivated to do this job and believed it was a great fit for me. I applied, and they accepted me. Songül Öden: What is your favorite part about the health mediator position? Amani Madi: The opportunity to encourage refugee women. Syrian refugees are human too-some tend to forget this due to their difficult experiences. It is very fulfilling to remind them that they are humans and worthy of having a decent life. Songül Öden: As you continue to work in this field, do you feel that it was a good decision taking the job? Is it what you hoped it would be? Amani Madi: Of course. Even listening to the stories of Syrian women empowers them and makes them feel better. Songül Öden: What are the biggest concerns/problems/issues you face as a healthcare mediator? Amani Madi: Many of the Syrians I talk to do not have their identity cards, therefore they cannot make use of available public services. They are also uncomfortable with local language-they struggle with applications to get id cards because they cannot communicate well. We provide them support in these fields. Songül Öden: What other problems have drawn your attention? Amani Madi: Another common problem I see in the field is high rates of child marriage and early pregnancies. Health mediators like us educate Syrian women and children about the laws concerning legal age to marry, and the adverse health effects of child pregnancies. Songül Öden: Was there a visitor to the center that you remember particularly well? Amani Madi: One woman came complaining of domestic violence-you could still see the bruises on her face. I can never forget her. We took care of her when she arrived at the center and informed her of her rights and the law. Visited her at her home to provide support. Songül Öden: Say, I was a refugee who knocked at your door. How would you help me? Amani Madi: I would provide shelter for you, inform you of your rights, assist you with obtaining an id card, and explain to you the legal system in this country. I would emphasize to you that child marriages are illegal, and that women subject to domestic violence have rights that enable them to protect themselves. Songül Öden: So, is this how things unfold when you arrived here? Amani Madi: We love everyone here. Without war, we would never leave our country. This is a temporary situation-one that anyone can find themselves in, as no one has a tent over their heads. Songül Öden: That’s an interesting saying, “tent over one’s head”. What does it mean? Amani Madi: Its a phrase we use to describe situations in which families cannot stay together, and have to separate. None of us are living under the same roof over our heads, we are all scattered in different places. Songül Öden: Amani Madi, you married young if I recall correctly? Amani Madi: Yes, I was 20 at the time. Songül Öden: If there was no war, if you hadn’t been forced to flee to Turkey, would you have been married at such a young age? Songül Öden: What would you have done instead? Amani Madi: I would have completed my degree and started working. Songül Öden: You also decided to have a child very early, why was that? Songül Öden: Would you want/like to return to Syria with your daughter? Would you want her to grow up there and go to school there? Songül Öden: Two years ago I came to visit your home. You had just recently given birth. There was a lady living across from you, a Turkish lady, and she was helping you take care of your daughter. Do you still see her and talk to her? Amani Madi: Yes, I still see her. At first I didn’t know how to bathe my baby, my neighbour was the first one to show me how. Our relationship is still good, in fact, my relationships with all my neighbors are very good. The more we talk, the more they hear my story, the better they understand me, and the more our relationships improve. They worry about me sometimes, ask me if I’ve been able to contact my parents. Songül Öden: Last time we met you couldn’t cook. How are things now? Amani Madi: I make meatballs and great dolma (laughter). Songül Öden: So Amani...what is it that you want the most? What do you pray for? Amani Madi: I pray that I can complete my education. I pray that I can see my family again. I pray that my daughter may have a better life than ours. I pray for the Women and Girls Safe Spaces, I love these centers. Songül Öden: God willing. God willing you will complete your education, you spoke about your education a lot. My greatest wish for you is that one day I see that you successfully complete your degree. Education is what saves girls. Amina: Yes. In my opinion, marriage is not that instrumental and that important when compared to getting education when it comes to saving women’s lives. Songül Öden: Yes, I agree. The UNFPA is lucky to have employees like you who recognize this. Amani Madi: Thank you. I am lucky to be working here. Amani Madi: Don’t forget us. Songül Öden: How could I? I tell your story to everyone, it lives on with me. This is my duty as a UNFPA spokesperson. Amani Madi: I love you. My family also loves you, I tell them about you all the time. Amani Madi continues to work as a health mediator caring for refugees in the Istanbul WGSS, one of 34 centres the UNFPA operates in Turkey. The centre that Amani Madi works in is financed by the European Civil Protection and Humanitarian Aid Operations (ECHO) and operated by the implementing partner Association for Solidarity with Asylum Seekers and Migrants (SGDD-ASAM). As a spokesperson for the United Nations Population fund, Songül Oden will continue to visit Women and Girls Safe Spaces, and to share the stories of Syrian women who have found refuge in Turkey.